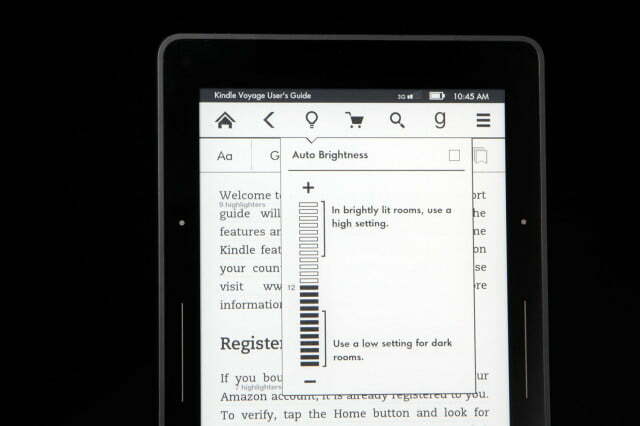 This is, without question, the best Kindle ebook reader yet. Between the improved specs and Amazon’s reading ecosystem, it’s the best E Ink reader you can buy. 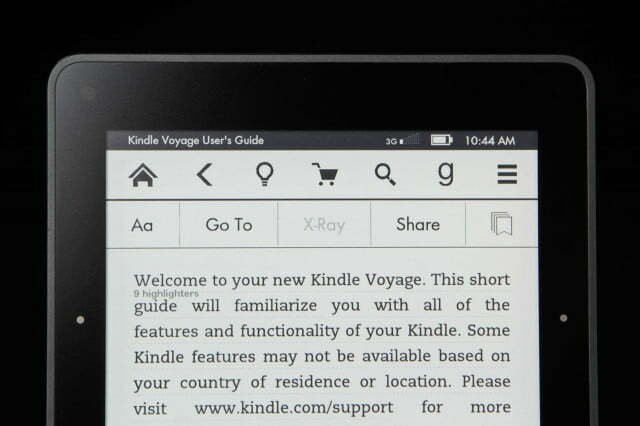 If nothing else, the Kindle Voyage is a sign that the ebook ship hasn’t sailed. 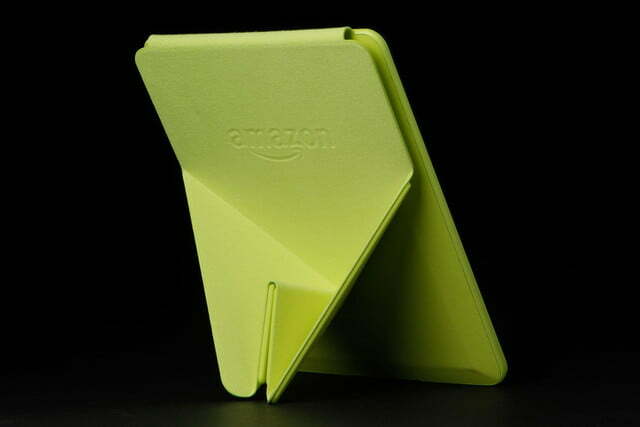 Amazon still has some R&D money to spend on the space, and it’s willing to gamble that big-time readers are still willing to shell out a bit of their own hard-earned money on just such a device. Lots of it, in fact. 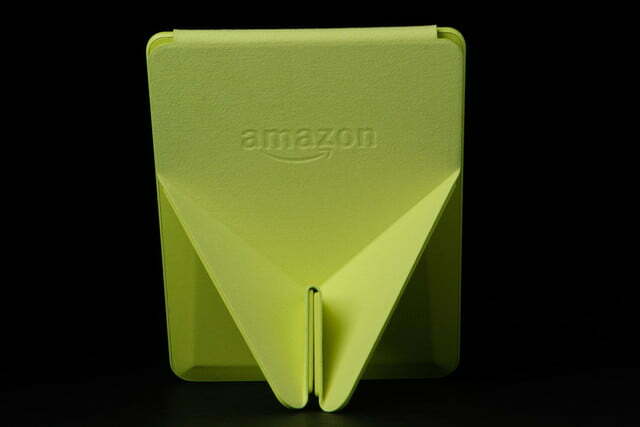 This time out, Amazon eschewed its longstanding view of the Kindle as a content delivery device, instead delivering a reader with premium specs that’s as focused on cutting-edge hardware as it is the books it’s delivering. 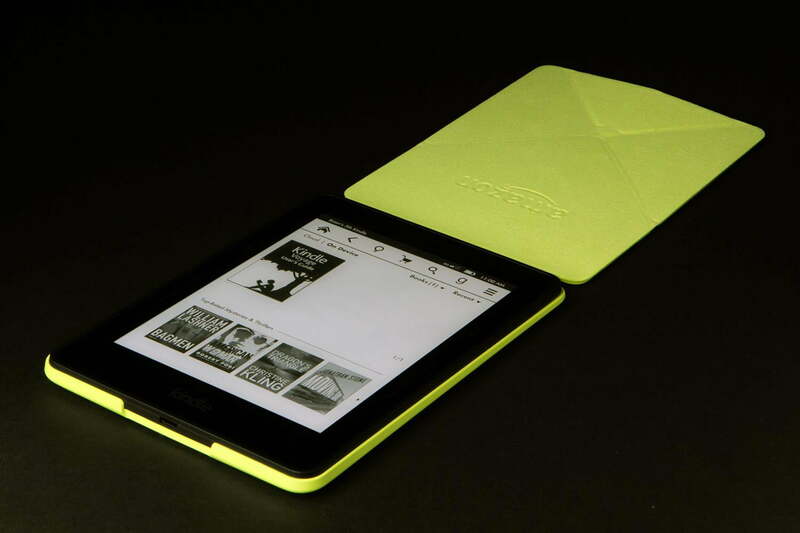 The Kindle Voyage is a sign that the ebook ship hasn’t sailed. 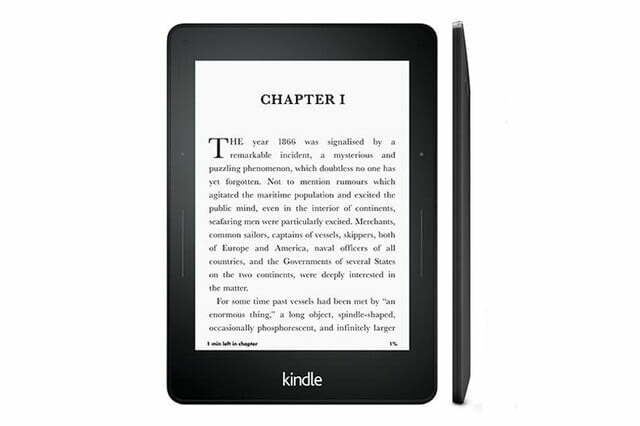 The Voyage marks a number of improvements over the second-generation Paperwhite. It has a thinner profile, higher-res screen, adaptive front lighting, double the storage (over last year’s model), page-turn buttons — and, with a flush screen, just plain old better looks. But such luxuries aren’t cheap. The new Kindle also comes with a starting price of $200 — that’s a number that includes the company’s “Special Offers” (built-in advertising). Dumping that adds $20 to the price, and 3G will set you back another $70. 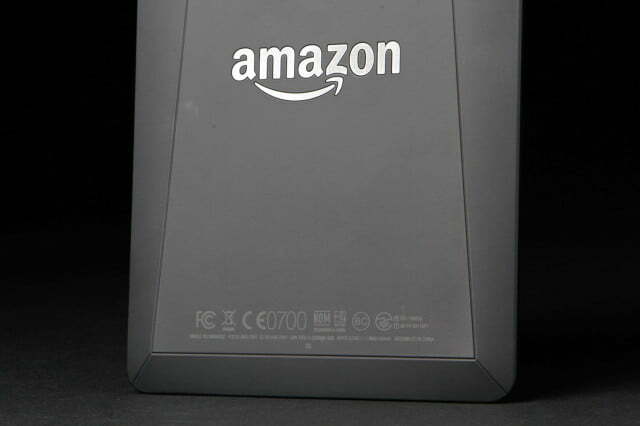 All told, it’s a pretty sizable premium over the base Kindle’s $70 starting price. That translates to a lot of books. With this generation, the Kindle finally sheds its plastic bezel, following the lead of Kobo’s high-end Aura devices. The display and bezel are now one contiguous piece, which serves to not only make the reader more aesthetically pleasing, but also shaves a few precious fractions of an inch from its footprint. The reader is noticeably smaller in each dimension, down to 6.4 x 4.5 x 0.30 inches from 6.7 x 4.6 x 0.36 inches. It was possible to slip the Paperwhite in the front pocket of a pair of jeans, but this time you can manage it with minimal maneuvering, making the reader portable. At 6.3 ounces for the Wi-Fi version and 6.6 ounces for 3G, Amazon’s also managed to shed a full ounce, just in time for fall coat season. 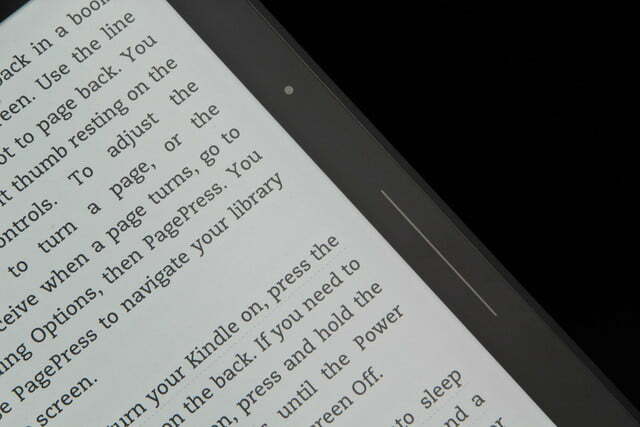 Even more interesting than the flush bezel is Amazon’s return to page-turn buttons. 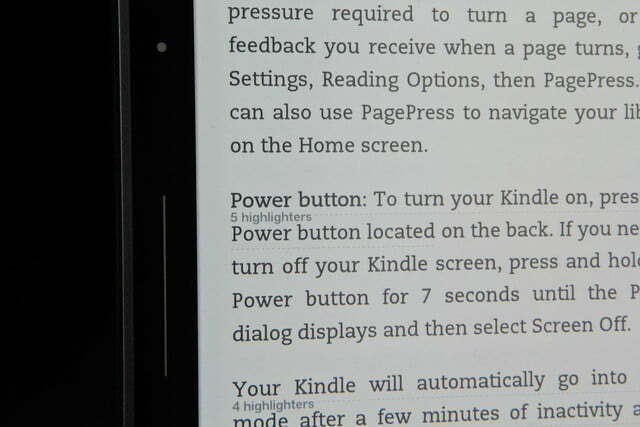 Unlike the Nook Simple Touch, the Kindle shed all of its buttons, save for power when it made the move to touchscreen. This was long a pet peeve of of mine, as a frequent one-handed subway reader (gotta be mindful of those sudden stops). Now, the company has maneuvered its way back into my good graces with the inclusion of not two, but four buttons devoted to the cause. The touch spots are designation by dots and lines. You can either tap sides with a thumb or give them a good, hearty squeeze, the latter of which will respond with a friendly haptic buzz. Strangely, holding down on the button won’t make the pages to flip continuous, but rapidly pressing down will cause things to turn pretty fast. The display and bezel are now one contiguous piece. Amazon’s clearly going for some semblance of unity across the Kindle line, and as such, the back of the Voyage is almost indistinguishable from the last generation of Fires (save for the orientation and lack of speaker. 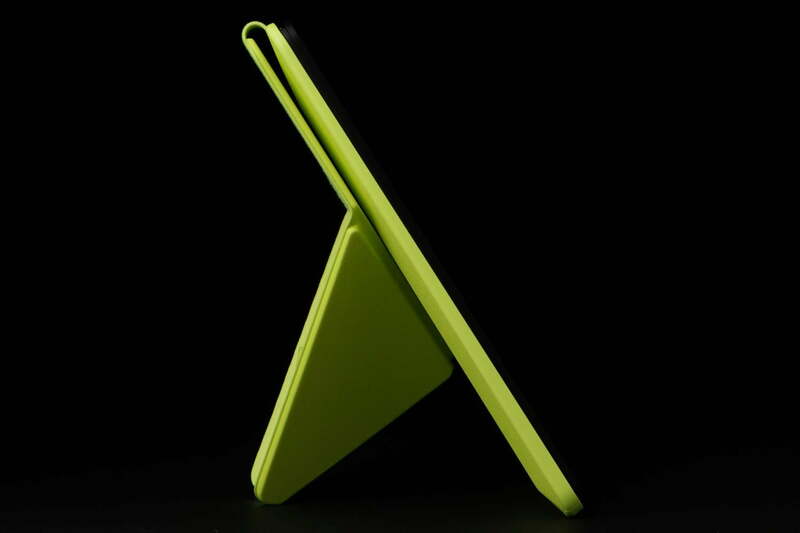 The back is still soft touch, with a glossy black top and angles borrowed from the company’s tablets which conform better to the hand than earlier readers. That’s a definite plus for those with tendencies toward marathon reading seasons, though, it’s not as ergonomic as B&N’s sadly departed Simple Touch line. 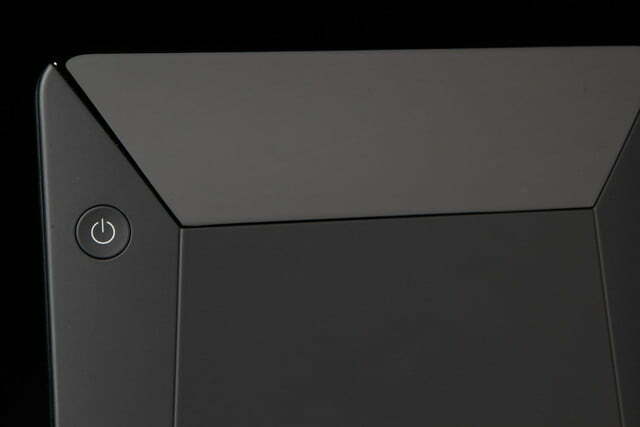 The power button has been moved to the back as well, thanks to the slimmer profile. It’s actually an ideal position for turning the device on and off while holding it in the reading position. 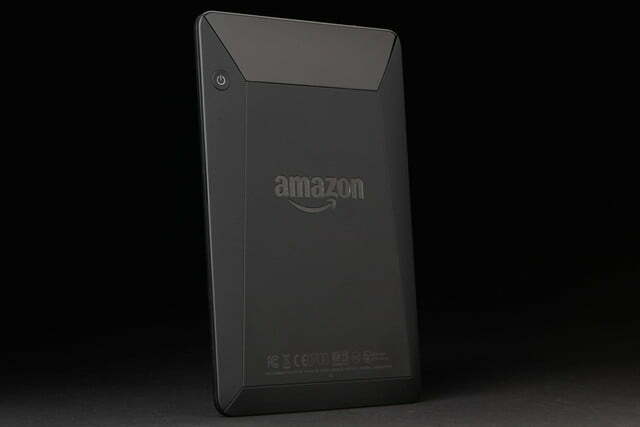 The back is also emblazoned with a huge Amazon logo smack dab in the middle. 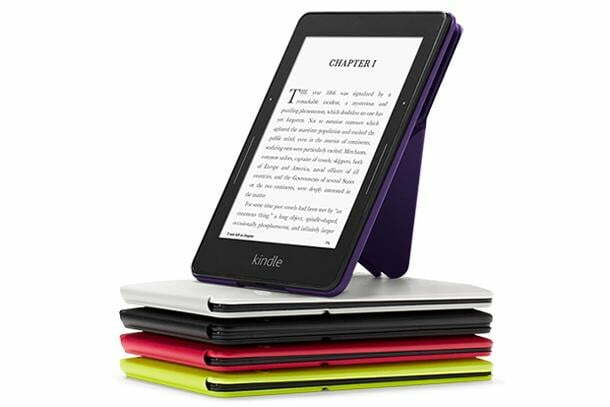 All-in-all, there’s a lot going on back there, and, from an aesthetic standpoint, we’d be lying if we said we weren’t partial to the simplicity of older Kindles. 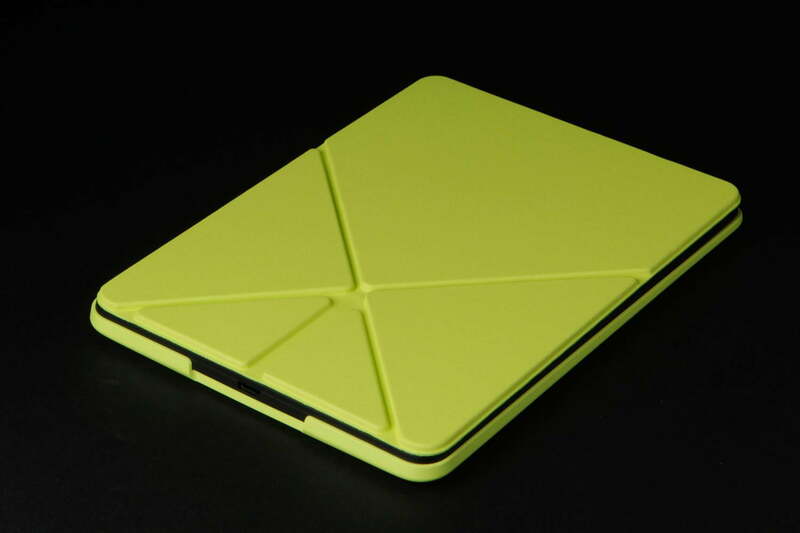 But let’s be honest: If you’re shelling out $200 plus a reader, you’re going to want a case for the thing, which means you likely won’t be spending a lot of time staring at the back anyway. And really, that’s an extremely minor quibble. At its heart, the hardware is the product of a company with years of experience in a space pulling out all the stops, and it’s a lovely thing to behold. 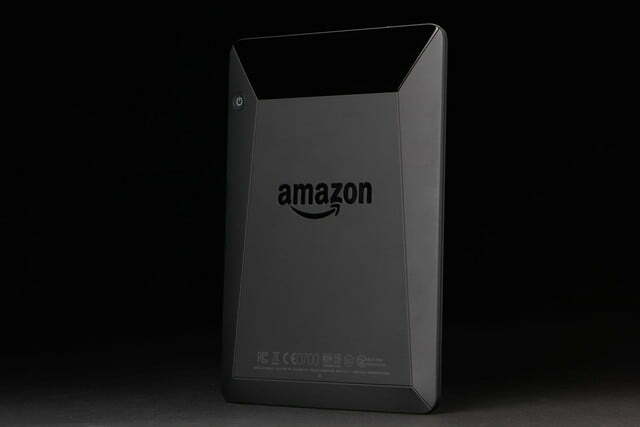 Amazon never did come around on expandable storage. 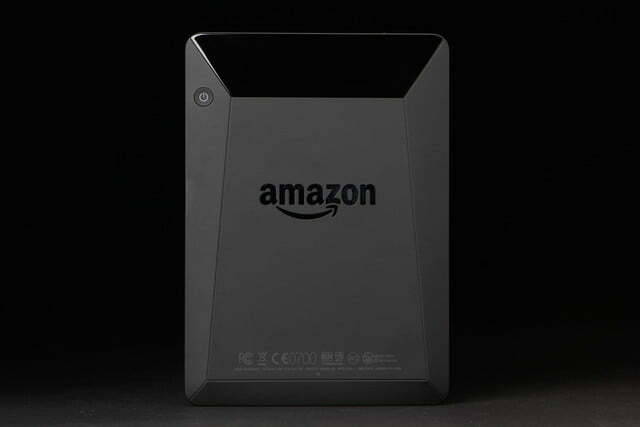 But while we’d certainly never turn down the option, its relative merits have become less pronounced over the years, between all of Amazon’s cloud-based storage, cross-platform syncing, and internal storage increases. A couple of months back, the company quietly doubled the Paperwhite’s storage from 2GB to 4GB and the company carried that number over to the Voyage. That translates to 3GB of space for books. Amazon’s apparently given up on keeping track of the number of books you can store on the thing, just listing “thousands” as the number in the product’s specs. If that’s not enough, the company still has a list of every book you’ve purchased along with where you left off easily accessible in the Cloud tab on the device’s main menu. Per usual, Amazon’s mum on processor specifics, stating that chip is “20 percent faster” this go-round. That’s compared to a 1GHz model on the second-gen Paperwhite. You’re unlikely to notice that difference while reading. 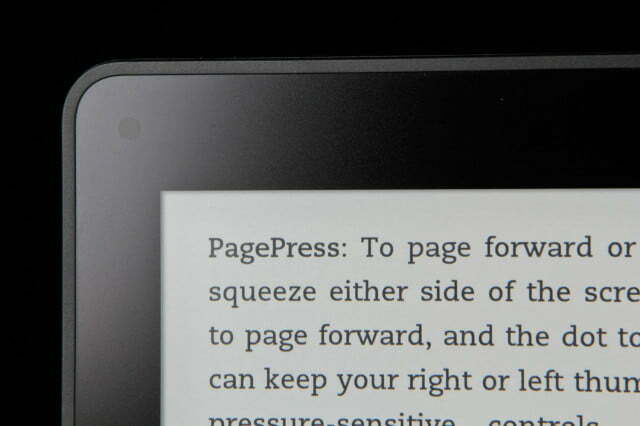 Placed side by side against the last generation, there’s no discernible difference in page-turn speed. The Voyage is, on the other hand, noticeably zippier when performing bigger tasks, such as opening a book. At this point, what you’re looking at is pretty comparable to the printed page. 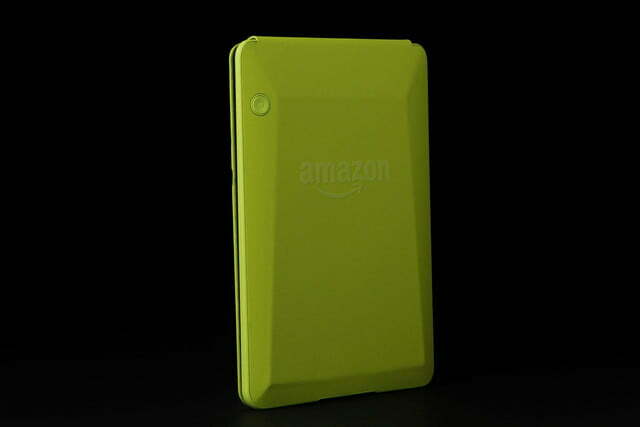 As with the storage, Amazon has become progressively more abstract when describing battery life, stating that, along with the Paperwhite and basic Kindle, the Voyage will last “weeks” on a charge. Your mileage will vary, depending on how much you read, how often you’re using wireless, and the brightness of your display, but most readers should get through their vacation on a single charge. Speaking of wireless, the options are the same as always: Wi-Fi and 3G. Given the $70 price difference, the base model will be plenty connected enough for most users. 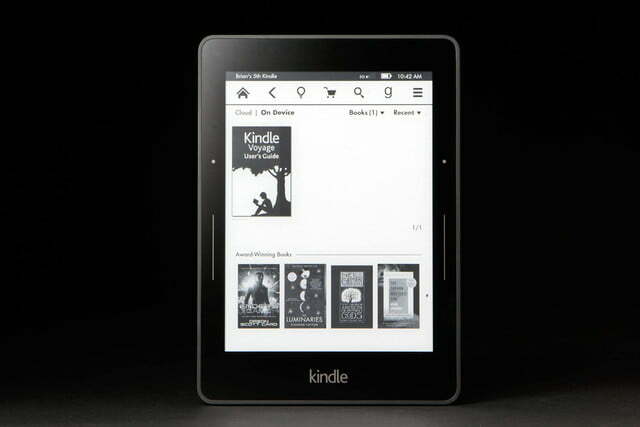 Frequent traveling voracious readers who really hate waiting on the other hand, might want to cough up the difference — which, it’s worth pointing out, is nearly the same price as the base Kindle model. Kobo experiments aside, the industry has settled pretty comfortably into the six-inch display. And it’s hard to argue that it’s not the ideal size for most readers. Five inches just doesn’t afford enough real estate and seven starts getting unwieldy. But while the size has remained largely the same, the screens have continued to get better with nearly every generation. At 300ppi (pixels per inch), the Voyage feels like it’s skipped a generation. That’s light years beyond the base Kindle’s 167 and the latest Paperwhite’s 212. It’s even well above the Kobo Aura HD’s 265, which played a major role securing that device’s position as the Cadillac of ebook readers when it was released nine months ago. What that means for most users is incredibly sharp text. If you’re prone to reading newspapers or magazines on the device, you’ll be getting higher-res grayscale images, but for the rest of us, it means the text really pops. At this point, what you’re looking at is pretty comparable to the printed page. Keep in mind, the screen on last year’s Paperwhite is perfectly fine, but placed next to the Voyage, the text looks downright soft. The contrast is even more pronounced when the front lighting is turned on. Once again, you accomplish that in the touchscreen settings. Amazon never did go in for the devoted light button, which has always come down to a matter of personal preference. The point is made even more moot with the introduction of the adaptive light. If you hold the reader at the right angle, you’ll see a small circle next to the top-right corner of the display which looks a bit like an opaque front-facing camera. That’s actually a light sensor. Tick the box next to the light meter in settings and the screen will automatically adjust based on the light level of the room you’re in — a great addition to save both your battery and eyes. The waterproof Kindle can’t be that far off, right? The Voyage gets bright: really, really bright. 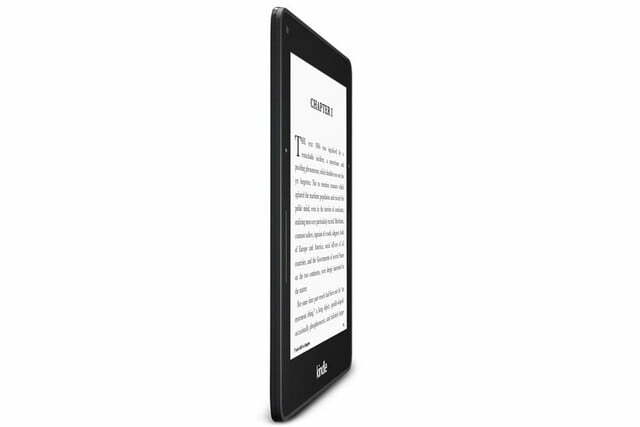 Helped along, perhaps, by the lack of display gap, the new Kindle may, in fact, hurt your eyes at full brightness in a dark room. The flush screen has also helped to alleviate light bleed from the sides, since there isn’t as much direct front lighting exposed off the screen. And while the display still isn’t a perfectly white color, the added brightness has taken the reader yet another step in that direction. The first-generation front-light readers look downright murky by comparison. 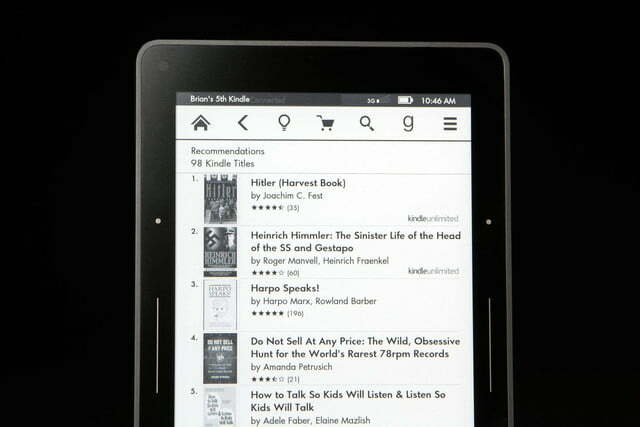 E Ink continues to be the best option for devoted electronic reading. It’s easier on the eyes, readable in direct sunlight, and can milk a heck of a lot of time out of a battery. It also keeps getting better year after year. Not much has changed on the reading front, and that’s not a bad thing. Amazon’s had several years to get this right and has happily recognized that, on a whole, simpler is better. 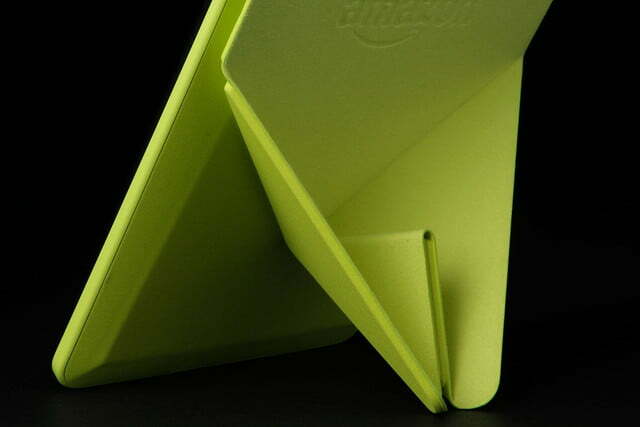 If you wanted distraction, you’d buy a Kindle Fire or any of the other innumerable tablets out there. 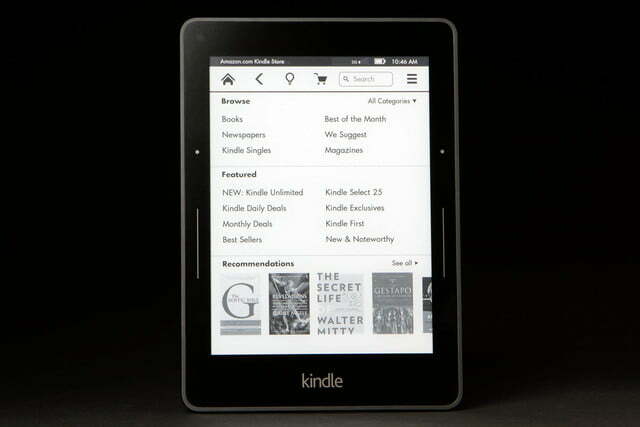 As such, the layout is nearly identical to older Kindles. You still get the same eight text sizes and six font styles, with all the same margin and spacing options. 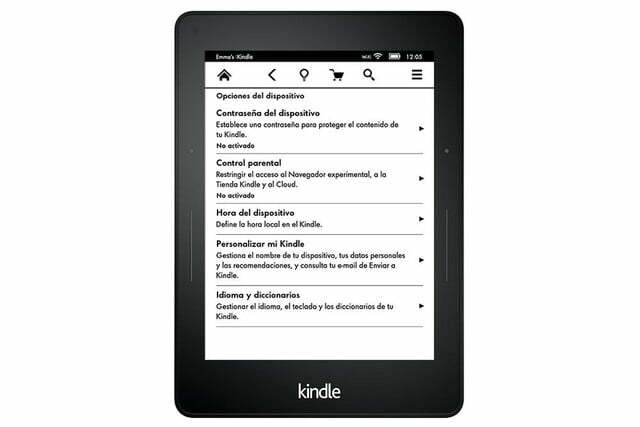 The touchscreen is extremely responsive and pages turn quickly. Amazon has never eliminated those full-screen refreshes, but it has greatly reduced them over past years. The frequency of flickers you get while turning the pages differs based on the number of non-textual elements in a book. I noticed a full-page refresh once every 14 pages, or some on purely text title — that’s down from every six a couple of generations ago. The display recognizes some dual-touch gestures, as well, so you can, say, pinch to adjust the font sizes. Now on its seventh generation, Amazon has built up an extremely robust ecosystem of extras, piece by piece. X-Ray brings plenty of contextual and supplemental information to the reading experience via Wikipedia, The Oxford English and publisher-provided information, while Goodreads brings a social element to the reading experience. The company still has a ways to go to fully integrate the social network’s recommendations into device, but it’s a tricky thing to do so without making it overly distracting. There aren’t a whole lot of brand-new features on the software side, this time out. As with the first-generation Paperwhite, a few features are still listed as “coming soon,” destined to roll out with a future software update. Among them is Word Wise, which brings automatic definitions to denser titles with more difficult words. There’s also an improved search that combines results from the library, store, and friends on Goodreads. Coming Soon is also neat. It offers up contextual information about a book as you start to read. Again, it’s not a lot of new stuff, but seven generations is a lot of time to get the relatively simple reading experience just right, and no one does it better than Amazon. In spite of Barnes & Noble’s absence and Sony’s relative silence, the devoted ebook reader arms race hasn’t ended. Kobo is pushing the space’s limitations and Amazon is following suit, incorporating new technologies into its mainstream products. The Aura HD showed us there is room for a high-end reader and the Voyage does a great job turning those features into a flagship reader. 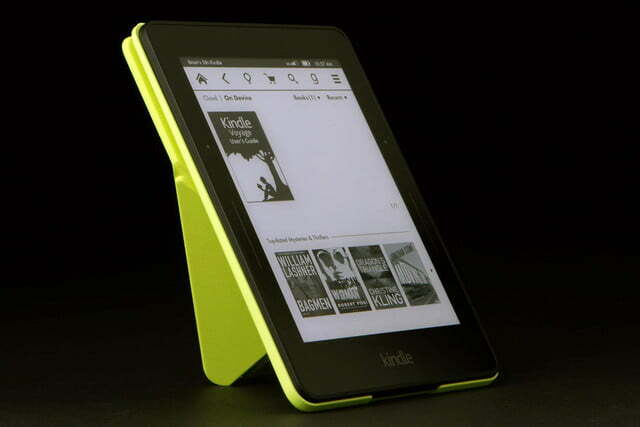 At $200 and up, this is a pricey book reader for Amazon. 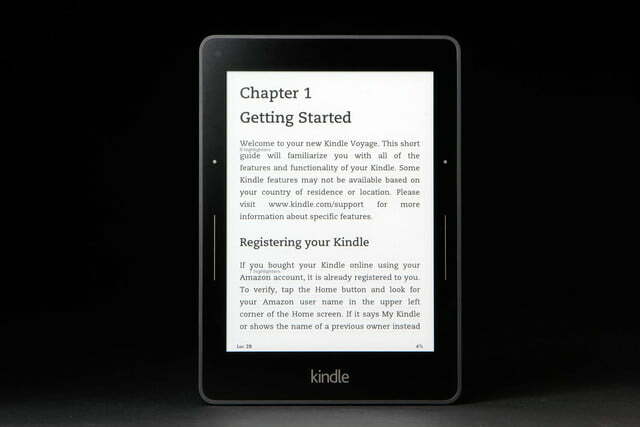 Most of you will be plenty content buying a cheaper Kindle. The Paperwhite, for example, is still a fine reader made even better with that quiet storage doubling, all with a $120 starting price. The new Kobo Aura H20, meanwhile, will set you back $180, with the added bonus of being able to read the thing in the tub. If you’re an everyday reader and can’t really remember the last time you left the house without a book — electronic or otherwise — in tow, the overall improved reading experience may be well worth the price of admission. 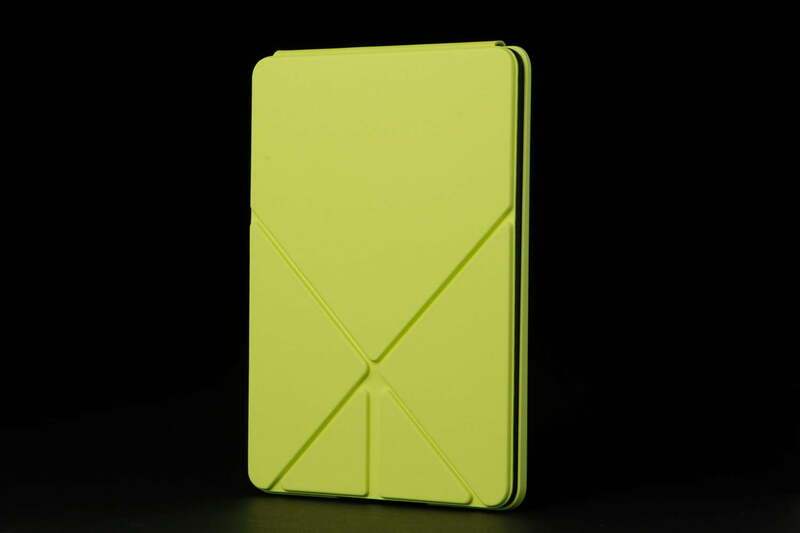 This is, without question, the best Kindle ebook reader yet. Heck, between the improved specs and Amazon’s industry-best reading ecosystem, it’s the best devoted e-reader you can buy. Casual readers, on the other hand, are better off waiting for the inevitable price drops, first when sales slow a bit and then when the company gets ready for a follow up. The waterproof Kindle can’t be that far off, right?